How is it that you started playing music? I was born in a family that listens to a lot of rock music, so it has been so easy for me to find my vocation. What are your names? / Who plays what? / How old are you? My name is Alessandro, I’m one of the lead singers and guitarists of the band. I’m 36 years old. Did you make music even when you were young? I’ve started to play at the age of 16. Where are you from? I come from Siracusa, in the far Sicily. What inspires you? Pink Floyd and David Gilmour are my main source of inspiration. Are you looking for a booking agency, and what are your thoughts around that? / Are you looking for a label, and what are your thoughts around that? Yes, we are looking for a booking and management agency. That would be so useful and helpful to spread our music everywhere there is a chance to appear. What ages are most of your concert attendants? From the age of 16 to 65. It’s so beautiful because there are three generations in a row. Do you always play the same songs live, or do you vary? We have a precise setlist that lightly changes (1 or 2 songs) from a concert to another one. Do you have a regular place you play live often? No, we used to play everywhere there’s a good chance. What was your first gig like? Our first concert was in a pub. When you play live music, you generally start from pubs. I’ve nice memories about that night. What was your latest gig? My last concert was in one of the most beautiful squares of Sicily: the Dome of Messina. 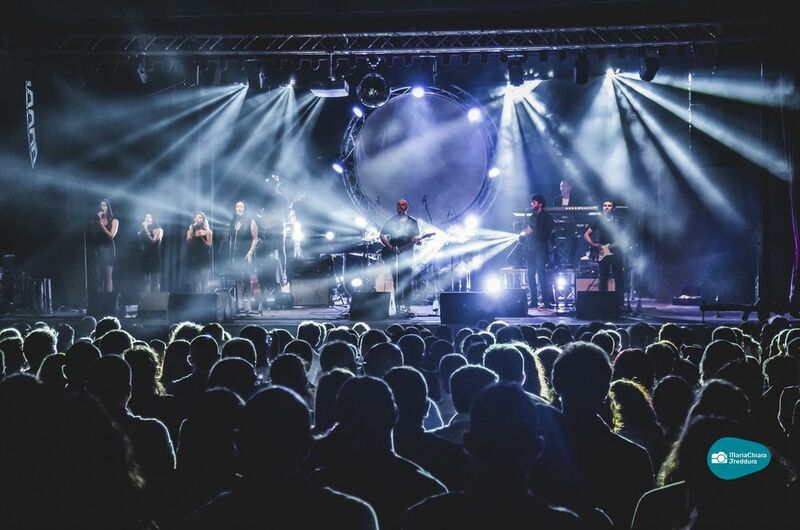 We will never forget that concert because we performed with Machan Taylor (one of Pink Floyd’s backing singers) and there was also a really nice audience. Have you had to cancel a gig? Sometimes yes, especially for bad weather conditions. But fortunately we’ve always found a solution. When did you start to sell merchandise, and what do you have for sale, Where can people buy your merchandise? We decided to print some t-shirts for Dark Side of The Moon 40th anniversary. They are sold out now but we think we will make more merchandise in our future. Today, Internet is the main way to listen to music… there are Spotify, iTunes, etc. Personally, I prefer to buy and listen to music on CDs and vinyls. It’s totally another story. What do you think about people downloading music instead of buying records now a days? / How do you think the music industry have changed because of this? They have been so able to create wonderful music in a time in which majors were interested in rock music. Today, unfortunately, it’s not the same thing. It’s so sad. Do you have any role models or idols? We mainly listen to Pink Floyd, Queen, Led Zeppelin and many others from the past. These are our idols. Is it easier to find inspiration from older bands, or bands that are more active today? Today, Greta Van Fleet apart, I think there are no bands able to impress old and young fans of rock music. What have been your biggest obstacles? There have been many obstacles. If you do your work well, there will be more difficult obstacles to face in the future. There’s the need to be strong and go on with the things that you believe in. What advice would you give other bands or artists? I suggest to use the heart, always! If you really love what you do, your audience will know how great you are. How do you get psyched for a gig? For a musician, the stage is a daily need. The emotions that you can feel performing in front of an audience is pure adrenalin. Do you have any new material? We are hardly working and rehearsing for our summer. We expect Summer 2019 will be great for our shows! Do you have something to add? Sure, I’ll give it one to you with much pleasure!